1. Crain’s Detroit Business examines the possible sale of the Titanic artifacts and who might be in the running to buy it. Candidates are Mariners’ Museum in Newport News, VA; Titanic Belfast museum (Belfast, N.I), and the Luxor Hotel in Las Vegas along with some very wealthy individuals. I would add, considering the interest of bringing Titanic II to UAE, that wealthy business people from there are also interested. Some might scoff at that but remember they have lots of money to spend and are tightly connected to their government (in some cases, they are actually in it). Having genuine Titanic artifacts on display would be a huge tourist draw. A good portion of the article is divided between what the valuation might be for shareholders and a examination of Mark Sellers III, who took control of Premiere some years ago after getting frustrated with it’s then leadership. Sellers tells Crain’s he is in no rush to sell quick but admits there is pressure to do so. You think? Look at how much time has passed since the salvage award came down till now. At first it seemed like things might be proceeding towards a sale and then it just stopped. This year we finally learned this mysterious consortium that signed a non-binding letter of intent could not get the money. Shareholders thought they would be reaping benefits right now and have not. Sooner or later patience will run out if Seller’s cannot get the sale done. I see lawsuits and demands for transparency about the sale coming soon if nothing happens in six months. 2. You learn of people finding something spectacular in garage sales or scrap yards, but this is the first I think for a Titanic plaque. Doug Turner spotted something dusty and dirty with “Titanic” on it. He bought it for $138 and cleaned it up. Turns out it is a memorial plaque for Titanic’s musicians. He found after checking it out online that it was really one of one. 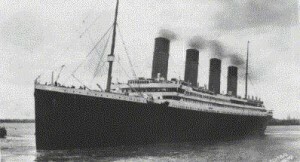 A photo he saw of it in a Titanic book said its whereabouts were unknown. It was was last seen in 1982.That is when he learned it was something really special–a genuine Titanic artifact of that time. Turner, who is in law enforcement, is making sure it cannot be stolen by Titanic fortune seekers. As to its worth, he has no idea but one can fairly guess since it is one of a kind it would fetch a very high price at a Titanic auction. For now he is not interested in selling it. It is currently on loan to Titanic Experience in Orlando where it will be shown next week. 3. The Titanic exhibit in St.Claire, MI which ended on 27 Jul had 4,2000 visitors and brought in $75,000 for the St. Clair Endowment Fund. The exhibit focused on the engineering behind the construction and included an18 foot long model of the ship done by Gary Kohs. His model has won praise for its accuracy. Kohs began designing the model in 1997 and completed in 2002. According to Randy Maiers, president of the endowment fund, they had people from all over the country came to the exhibit at the Moore Boathouse.